Three types of "K'NEX people" are available. The first is the K'NEXMAN figure shown in the photo opposite. The arms and legs can be bent into lifelike positions, and body/head colours vary. 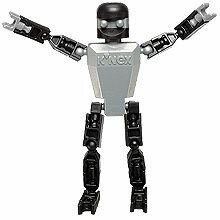 K'NEXMAN is built from a pack of parts - see Assembly instructions. A red helmet is also available, which can be fitted onto the head of the K'NEXMAN, as shown. The second type of K'NEX person is the "Person top half" shown in the photo. This can be attached to any classic K'NEX connector. Characters vary. 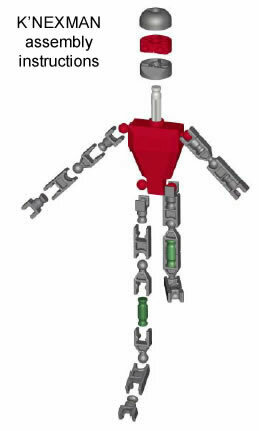 The third type of K'NEX person can be fitted onto any K'NEX brick, as shown in the photo. K'NEX brick people are available in a wide range of sizes, designs and colours.